The CUBAN CRISIS what does it mean? It is for this reason that some have termed the period from 70 to 170 A.D., "The Lost Century," for we indeed know very little about this period except, as Hurlbut noted, that many changes took place which greatly modified the Apostolic Church of the first century. We will see these changes reflected in the literature of those who wrote after the curtain once again ascended revealing the church and the beliefs of that later period. Among the earliest of the second century writers who mentions Peter and Rome is Irenaeus, Bishop of Lyon, whose writing are dated about 170 A.D. Here we see the beginning of attempts to establish the authority and importance of the Roman church by the claim that it was "founded and organized at Rome by the two most glorious Apostles." We have already covered in detail not only the complete absence of Biblical proof, but the clear denial from the Scriptures that Peter founded or established the Roman congregation. When Paul first wrote to it in 55 A.D., it was not yet "established" (Rom. 1:11), and we have his claim that he "strived to preach the gospel, not where Christ was named, lest I should build upon another man's foundation" (Rom. 15:20). So throughout the entire record until Paul's death at Rome, there is nothing to confirm Irenaeus' bald assertion that the church at Rome was "founded and organized" by Peter and Paul. But let us observe again, that we still have no mention of Peter's death at Rome under Nero — only for the first time in our study the suggestion that Peter helped found the church at Rome. So to Irenaeus' claim that Peter founded the Roman church, Dionysius adds that he likewise "planted" and "taught" the Corinthians! How is it that Luke entirely overlooks that noteworthy fact in the Book of The Acts of the Apostles? And what are we to make of Paul's claim to the Corinthians, "I have planted, Apollos watered; but God gave the increase" (I Cor. 3:6)? Are we to conclude that Paul deliberately ignores the work of his fellow Apostle at Corinth? He adds in the fourth chapter and fifteenth verse, "For though ye have ten thousand instructors in Christ, yet have ye not many fathers: for in Christ Jesus I have begotten you through the gospel." Again no mention of Peter at Corinth — unless one wishes to relegate him to the role of a mere instructor of the Corinthians. And here we learn for the first time that Peter and Paul were martyred at the same time after teaching together in Italy. Note that not a shred of proof is given to back these impressive claims that we are asked to accept only on the word of an obscure Corinthian bishop long after a stormy and spiritually degenerative history of that same church. Strangely, these passages are cited as proof, but they go completely unproved. No attempt is made by Eusebius, or any ecclesiastical historian since, to reconcile these claims with the New Testament record, for that would be an impossibility. Are the book of Acts and The Epistles to the Corinthians to be used as proof that Peter assisted Paul in planting Corinth? And are the Prison Epistles and the Pastoral Letters to be cited as substantiation that Peter and Paul "taught together in like manner in Italy"? And if these appear as the preposterous claims they are, then why should we feel obliged to accept that Peter and Paul "suffered martyrdom at the same time"? These are not the words of men speaking the truth according to the inspired word of God, but men of the same mind who wrote the spurious and apocryphal Gospels and Acts of Peter and Paul and the many other apocryphal legends about Peter and Simon Magus that began to be circulated widely after about 150 A.D. Such literature flourished in the latter half of the second century, and was later noted and disclaimed by Eusebius. [ibid., (Vol. I, pp. 133-134), 3, 3, 2.] One wonders what were the motives of those who devised such spurious legends. Were they intent on inventing such fables to find Peter in Rome at any cost? Was it necessary to confuse the whole issue thoroughly in order to prevent the discovery of only one pseudo-Peter at Rome? These are searching questions that probably cannot be answered at the present time, but the elaborate lengths to which the apocryphal literature goes — all the same direction — cannot help but raise the question of motive. Another question concerns the degree to which such legends influenced later writers. Peter and Paul before Nero at Rome — that is the stuff the apocryphal legends were made of. Certainly the church historians could not claim they were inspired or to be regarded as canon, but how much of their content did they absorb and put stock in? 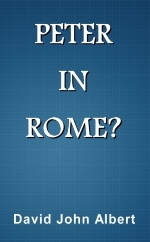 We know that the Peter-in-Rome theories did not get their start in the Bible. Did they allow, indeed, were some quite willing to let the apocryphal works color their thinking? It is certainly worth noting that it is after their circulation in the latter half of the second century, that the ideas contained therein began to appear. From fragments of Adumbrations or Comments by Clement of Alexandria on the General Epistles, we have preserved through a Latin translation by Cassiodorus a brief record of Peter at Rome by the Alexandrian Clement. We should assign this writing to late in the second century or just after the turn of the third century. Unlike the statements of Irenaeus and Dionysius, Clement of Alexandria makes no unusual claims, only suggesting that at some time Peter preached publicly at Rome before high-ranking Roman citizens. This statement need present no difficulty unless one is determined to prove that Peter was never at Rome. But it certainly could not be used to prove that Peter had a long episcopate there, that he died there under Nero, on the same day as Paul, etc. It is this development of tradition and Christian legend at the expense of Biblical truth and historical accuracy, that this author seeks to call special attention to in this thesis. We cannot now reconstruct with certainty the events of the first century removed as we are from them by nearly two millenniums, but we can be, as he suggests, "fundamentally skeptical" in our approach, especially when we see contradictions of revealed truths and conflicting versions of the same story. Further, we must bear in mind that authors then as now did not write without motives. Fabulous tales of the Apostles were not written as children's bedtime stories, nor simply with a warm, nostalgic glow of earlier, cherished events. They were written, we can be sure, with the intent of advancing a line of thought or doctrine, of establishing authority and historicity, of persuading and convincing the readers of their writing to their conclusions. Truly, "their trustworthiness must be challenged from the start" if we are not to follow the development of so-called Christian tradition into error.